This is it! 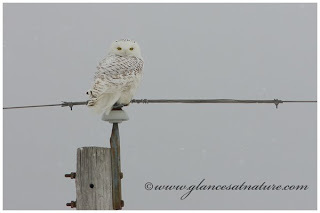 The very Snowy Owl living on Kruger Road! I did not take the photograph, it is by Josh Haas and you can see his blog entry about finding the owl and view more of his wonderful photographs here. Over the weekend I had the wonderful experience of seeing the owl three times. The best was on Valentine's Day morning. En route to breakfast with friends, I drove slowly across Kruger Road, scanning the now snow-less fields for a blog of white. I read that Snowy Owls prefer to stay close to the ground, so every lingering pile of ice appeared a likely candidate. I came over the top of the hill, looking to the right where I had seen people with binoculars searching across the field into a large stand of pine trees in the distance a few days earlier. No flash of white. My eyes came across the road (I was still driving, after all, had to stay safe!) and I realized that the owl was perched atop an electric pole maybe 50 feet from me. Slammed on the brakes and the car stopped just across the street from the pole, so I was peering straight up at the owl, peering down at me. We shared our amazement for what felt like a full minute before another car approached and the owl dove off the pole, swooping across the fields to put distance between us. What a Valentine! I caught him again on Saturday late afternoon in the same place, and so Sunday morning I took my camera and sure enough, he was there. Apparently he's grown tired of celebrity, though, because as soon as my car slowed he flew off. Luckily I had opened the window and turned on the camera before coming over the hill, so I caught a view of him flying away. What a magnificent sight! Please won't you be my Valentine? Our friendship makes life oh-so fine! But you must enjoy it online! you can't eat this so I will...yummy! Have a very sweet Valentine's Day!